Six million gallons of raw sewage in Tijuana, Mexico has entered the Tijuana River, flowing north to the United States near San Diego and into the Pacific Ocean, closing beaches and shoreline to human contact from the border to Coronado, a twelve-mile stretch of shoreline, including popular Imperial Beach. Although there has been no claim that the sudden arrival of thousands of migrants was a factor in the sewage system overload, it is not hard to imagine that it was. 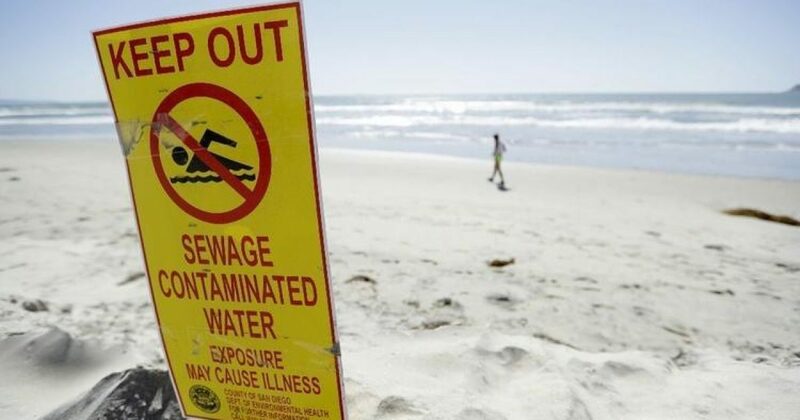 Millions of gallons of raw sewage has spilled into Mexico’s Tijuana River and is flowing north into California, fouling beaches in San Diego County, where swimmers and surfers were urged to stay out of the ocean. If the spill that began late Monday continues unabated, it could be the largest since early 2017, when coastal waters were tainted for weeks, the Los Angeles Times said. In September, California Attorney General Xavier Becerra joined the U.S. cities of Imperial Beach, Chula Vista and the Port of San Diego in suing the Trump administration over sewage spills and other toxic flows coming from Mexico. The lawsuit seeks to force the U.S. government to upgrade the capacity of pumps in the river and catch basins in nearby canyons. The systems are intended to divert flows to the South Bay International Wastewater Treatment Plant before the waste reaches beaches. More than 6 million gallons a day of raw sewage has spilled into the river since Monday, authorities say. The U.S. section of the International Boundary and Water Commission said Tuesday that officials in Mexico attributed the leak to a ruptured collector pipe. The aging collector underwent major upgrades over the past year but is not fully rehabilitated, officials said. Smells like sewage because Tijuana dumps it into the river that flows into the US. Or is that the United States fault too? According to the state of California and the cities of Imperial Beach, Chula Vista, and San Diego, it is all President Trump's fault. All are suing him for sewage coming from Mexico. What is the matter with the brains of these people? The sewage has given them all shitferbrains!